A Ticket To Ride—And Ski – Is It Finally Time for ONE Wasatch? ONE Wasatch would connect the 7 world-class ski resorts in Park City, Little and Big Cottonwood Canyons, on private land with private money, providing access to 18,000 skiable acres, 750 named runs, and 100 lifts—with a single lift ticket. An interesting new concept? “An interesting old concept,” gently corrected Park City Mayor Jack Thomas, who remembers the interconnect idea being kicked around as long as forty years ago. One might wonder why, if it’s such a good idea, it hasn’t been done yet. Nathan Rafferty, President and CEO of Ski Utah, assures me that the idea has “stayed around because it’s a good one, but so complicated that no one’s pushed it.” Until now. While there seems to be no single reason why Ski Utah finally decided to take the first step in creating a Central Wasatch interconnect—if announcing the concept can be considered a step—there are several reasons why it may be the right time to do so. For one, all 7 resorts have agreed that it’s the right time. When Ski Utah unveiled the concept in mid-March, the general managers of Snowbird, Alta, Solitude, Brighton, Canyons, Park City Mountain Resort (PCMR), and Deer Valley were all there. Resorts that are in direct competition with each other—including two that are locked in a very public lawsuit—have joined forces because the concept, as they see it, will be good for the Utah ski industry as a whole. This opportunity positions Utah well in a market where “the trend has been for larger resorts,” observed Dave DeSeelhorst, General Manager of Solitude. As lifts move more people more quickly, grooming techniques reach more advanced terrain, skis go faster, and clothing keeps people warmer, skiers “can and want to cover more terrain in less days—more terrain on their vacations.” Individual resorts face pressure to expand to accommodate their skiers’ desires for more. The interconnect would allow the Central Wasatch resorts to expand their offerings without creating new terrain. In effect, ONE Wasatch would offer Utah skiers a larger, virtual ski hill, by eliminating resort boundaries. The days of spending your whole family ski trip within the borders of one ski resort would be over. Unlike creating one massive resort, however, the character of each individual resort would be preserved. People would still be able to frequent their favorite mountains, towns, inns, and watering holes, albeit with a little more daily flexibility over the snow. Utah ski resorts believe in their product and believe that, once they get new skiers to try Utah skiing, they will inevitably come back. 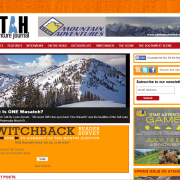 ONE Wasatch is one more reason for skiers to try us out. The concept is thus intended to increase visibility and marketability, which should, in turn, translate into increased skier days and revenue. Utah currently enjoys about 4 million skier visits per year. Mr. Rafferty believes ONE Wasatch will attract national and international attention sufficient to rival the post-2002 Olympics bump, or about one million additional annual skier visits over five years. Others, including Mr. Wieringa, Mr. Wheaton, and Mr. DeSeelhorst, are more conservative, hoping for a 10-15% increase over time. Even this more moderate bump would not be insignificant. Based on recent estimates of how much skiers spend on an average day, an increase of just 10% could yield about $130,000,000 in additional annual revenue. These skier days and revenue would be spread among 7 resorts and the many towns that provide pillows and bar stools. And, for now, there seems to be plenty of room for them. Bob Bonar, General Manager for Snowbird, feels that the Central Wasatch has the ski runs, hotels and restaurants to easily “go to five or six million skier visits per year.” Mr. DeSeelhorst and Mr. Wieringa agree that the resorts are all operating under capacity. According to Bill Malone, the President and CEO of the Park City Chamber of Commerce and Visitors Bureau, there are also plenty of empty beds in Park City, where lodging averages only 50% occupancy. Of course, it’s closer to 80% during peak times, but that still leaves almost 5,000 empty pillows during Christmas. This increase is obviously supported by the 7 participating resorts, but also by those resorts that are arguably marginalized by the concept. John Loomis, Snowbasin Resort’s General Manager, looks at ONE Wasatch as “just one more arrow in the quiver of skiing in Utah.” If the concept makes someone come to Utah who would ordinarily go to California or Colorado, Mr. Loomis figures, they’ll come back and the next time they might branch out. Surprisingly, California seems to look at it much the same way for a similar reason. Brook Taylor, from the California Governor’s Office of Business and Economic Development, wished Ski Utah “the best of luck, especially if it encourages more international tourism.” In other words, “a rising tide raises all boats,” to borrow a well-worn phrase from Mr. Loomis. Not only does ONE Wasatch enjoy broad industry support and seem to make business sense, but technology has largely solved logistical issues regarding revenue-sharing and ticketing that, at one time, might have seemed prohibitive. By making it possible to track a skier’s lift usage, technology allows the resorts to determine what percentage of a skier’s time is spent where and to share revenue accordingly. According to Mr. DeSeelhorst, Brighton and Solitude implemented this method with their Big Cottonwood pass this year with much success. So, the issue is not whether the 7 resorts can share revenue, but rather, when they will adopt the system allowing them to do so. Although Ski Utah has not determined how the ONE Wasatch ticket will be priced, technology can also help with cost-containment, by giving Ski Utah pricing flexibility. That is, the ticket could be priced for one resort, all 7, or anywhere in-between. “The resorts could even sell a pass for one lift,” Mr. Rafferty explained. “It’s that scalable.” Regardless, Mr. Rafferty and Mr. DeSeelhorst agreed that the resorts wouldn’t go to all this effort and then price the experience so high that it won’t get used. Although the PCMR-Brighton and Solitude-Alta connections are also on private land, they will require additional review due to their locations. While the PCMR-Brighton connection has raised little concern, the Solitude-Alta connection through Grizzly Gulch has been met with loud protest. Volume alone will not win the argument, but Ski Utah will face valid questions relating to watershed protection, backcountry access, and transportation. The resorts can cite water studies to prove that water impacts have been and will be mitigated. They can argue that backcountry skiers should be less obstructionist and more willing to help develop long-term, sustainable, backcountry access in Little Cottonwood Canyon. They can point to on-going transportation planning by the Mountain Accord to demonstrate that the issue is being studied. However, whether they win these arguments administratively may be less important than whether they win them in the court of public opinion. How ONE Wasatch as a whole may impact Park City is also a valid concern. Surrounded as they are by public land, Little and Big Cottonwood Canyons face development restrictions not present in Park City. As the primary bed-base for the concept, Park City may need to grow to accommodate ONE Wasatch. Mr. Rafferty viewed this dilemma as a “great problem to have.” Mr. Malone and Ms. Smith both felt that Park City could absorb the additional visitation, as it would occur over time. Although the town may technically have sufficient places to sleep and eat, and even more room to grow in that regard, the roads are busy and the parking lots are already full. Adding even more cars to this congestion concerns many locals. Mayor Thomas, Mr. Malone, and Ms. Smith all stressed that careful transportation planning would be necessary, perhaps in conjunction with the Mountain Accord. This cautious optimism is shared by many who are excited by the possibilities that ONE Wasatch presents but mindful of its potential difficulties. As Mr. Bonar said, “ONE Wasatch is a great way to do something really cool if it can be done in an environmentally-friendly way.” Through the Mountain Accord, open discussion, education, and perhaps a few, good, long hikes through the proposed interconnect areas, this “if” is attainable. Compromise is possible and to be encouraged, by both sides, because ONE Wasatch is an old idea whose time has finally come. “Ski resort GM’s line up to back ‘One Wasatch” was the headline of the Salt Lake Tribune Wednesday March19, 2014. The article referred to it as an historical event. Ski Utah, the marketing group representing each of the state’s resorts, announced the ski areas of the central Wasatch had agreed to work on making connections that would enable a person to visit all seven resorts with one ticket. According to the One Wasatch webpage these connections would be developed on private land and that this concept could be a reality within a few seasons. Further along the article stated that this connected Wasatch would be done with a collaborative effort presented through the Mountain Accord process, of which Ski Utah is a member. They conclude that when completed Utah could then boast that its skiing had better access and more options than the competition. The map displayed on the One Wasatch website highlighted areas of the possible connections. The Monitors on the Park City Ridgeline between The Canyons and Park City Mountain Resort, Park City to Brighton over Guardsman’s Pass to Hidden Canyon, and Twin Lakes Pass and Grizzly Gulch between Solitude and Alta. These three areas are known in the local community as being areas of backcountry use. With this announcement Utah’s ski and snowboard industry had painted a bright picture of what their future might be, but what did others think? “Who wants this expansion?” Salt Lake resident, physician, and photographer, Howie Garber asked. For the past 30 years he’s been fighting for local conservation and has authored the book, “Utah’s Wasatch Range: Four Season Refuge”, that makes a compelling case for preserving the very mountains the One Wasatch Concept would impact. I’d stopped by his house to get a signed copy. Sighting the Wasatch Tomorrow study, conducted between 2009-2010, Howie continued, “94% of the 16,000 citizens surveyed supported limiting resort expansions… When do local populations get an opportunity to determine how much takes place in their backyard? They’re building something for the sake of the tourists!” Howie was obviously concerned. He’s witnessed backcountry terrain in the mountains next to the Salt Lake Valley slowly gobbled up by ski area expansions; The Supreme lift at Alta, Honeycomb Return at Solitude, and Snake Creek and Great Western lifts at Brighton. His concern also carries over to the watershed, environment, development, lift prices, increased traffic and global warming. “40 years from now winters in Utah are going to look entirely different,” referring to the predictions that the winter snowlines in the Wasatch will retreat to higher elevations. Echoing Howie’s concern is Carl Fisher, executive director of Save Our Canyons (SOC), a community driven conservation group whose focus is on preserving the Wasatch Mountains, who told me that SOC was adamantly opposed to the One Wasatch Concept. He feels any further expansion would be a compromise on top of the compromises SOC has already made with the resorts. Save Our Canyons was actually created by locals who were concerned with overdevelopment of the Wasatch in response to the building of Snowbird Ski Resort in 1972. She had a point. A civil engineer with experience in transportation and environmental consulting, Laynee had moved to Utah to live in the mountains. Being an active member of the outdoor community she’s focused her work on integrating manmade development with the natural world. Through the Mountain Accord Laynee sees an opportunity to do something remarkable that will preserve the Wasatch for generations to come. I didn’t have an answer for her at the time, but maybe “now” is appropriate. What is the Mountain Accord? In brief it’s a progressive approach to develop a blueprint for future planning of the Central Wasatch Mountains of Utah. Using findings from previous studies the Mountain Accord is currently focused on developing guidelines for the area east from the Salt Lake International Airport to Summit and Wasatch Counties and from Interstate 80 south to the Little Cottonwood Canyon Divide. One key element that should not be overlooked is that this whole process is open to the public. Anyone may submit comments in writing or online, review the group’s documents and attend stakeholder meetings. Laynee explained that currently the four systems groups of transportation, environmental, economic and recreation are independently gathering best-course-of-action ideas for their individual sets for the next 150 years in the study area. This August all groups will be presenting their idealized scenarios. As Laynee described it they will figuratively be laying plans one on top of each other to discover how closely or how far apart each plan lines up. She predicts there will be huge areas of agreement and small areas of disagreement. My next conversation was with Black Diamond Equipment’s CEO and Mountain Accord executive board member, Peter Metcalf. He had multiple perspectives on the One Wasatch Concept. Personally he is against ski area expansion and, like Carl, wants a better understanding of the value of the surrounding open spaces. In the past 25 years, since bringing Black Diamond Equipment to Salt Lake, the expansion of ski resorts within the Wasatch Mountains has been a constant fight. The availability of inbounds and out-of-bounds skiing was one of the initial reasons the company chose the Wasatch. His second perspective comes from his professional experience. He considers the One Wasatch Concept a marketing move to attract more skiers to the state and understands Ski Utah’s desire to one-up the competition, but he doesn’t buy it. “Who’s really going to ski all resorts in one day and is it even possible without sitting on lifts all day long AND doing mediocre traverses?” Peter continued by reflecting items I’d heard from Carl, Howie and Laynee. Winter backcountry use throughout the Wasatch is growing as well as summer use. These segments of users (hikers, bikers, campers, climbers) have to be considered in the overall plan. Peter had given me a lot to consider. I needed to follow up with Carl. Eventually I was back where I began, sitting in Howie’s living room asking questions. Over the next 30-40 years the population of Utah is predicted to double and with it so will the pressure on the Wasatch Mountains. Having the ski industry focused on growing their numbers while the community faces the issues of clean air, growing populations, transportation, watershed, environment and development is all part of the picture. Who wants One Wasatch? I’m sure tons of people who are connected to the ski tourism industry and love skiing at Utah’s resorts. Who doesn’t want this? Maybe people who find refuge in this small gem of a range. And I’m certain there are people who want both. Howie broke the heaviness in the air. “The bottom line, Louie, is that it’s about the preservation of powder skiing, which I truly believe is a dwindling natural resource!” We both laughed, but he was serious. For him it’s powder, for someone else it could be wildflowers and others, the value they find in open space. For Ski Utah it’s sharing our world-class terrain. If we can agree that everyone is passionate about preserving the Wasatch then the only question we need to ask is how can we do that best?